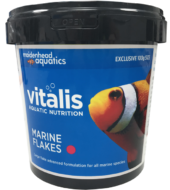 Vitalis Aquatic Nutrition provides high-quality fish foods that are scientifically tailored to the specific dietary requirements of fish from all around the world. Using natural ingredients and unique formulation processes, Vitalis feeds are soft, making them easy to digest, promoting natural feeding habits and making a big difference to fish health. Their low leaching formulas and high digestibility even have significant benefits to water quality and filtration systems.